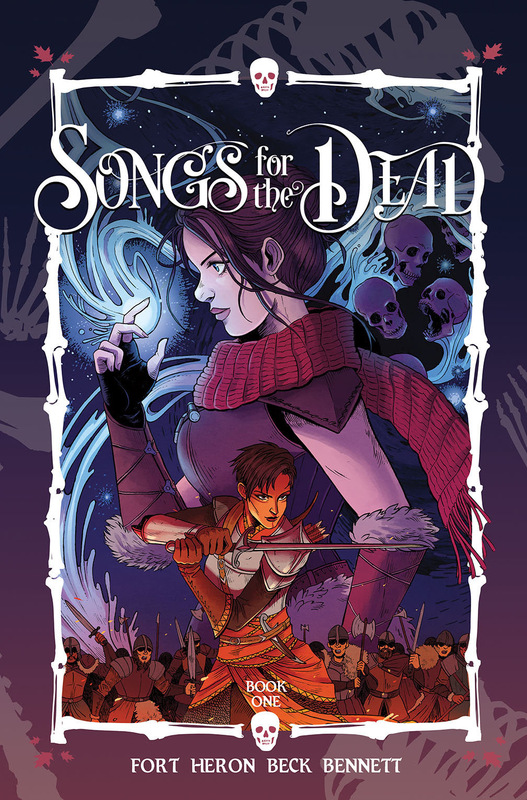 Created by Andrea Fort and Michael Christopher Heron with art by Sam Beck, Songs for the Dead is a unique book from Vault Comics. It’s full of action, adventure and some truly funny moments. It’s also full of people rising from the dead, which is bound to happen when the main hero is a necromancer. The story follows Bethany, a young minstrel who is always looking for an adventure. She’s a traveler, making her way from town to town, taking odd jobs here and there. In the world around her, necromancy has been outlawed, so she must keep her identity as a necromancer secret. When she strolls through a town and finds that a young boy has gone missing, she knows she has to do the right thing and find the boy. Things don’t go exactly as planned, and it takes Bethany on the adventure of a lifetime. With new allies and enemies (both living and dead) along the way, she will try to make her way to a mysterious place called The Covenant, where people like her can live in peace. Collecting the first four books in the series, it is a great introduction into this world. It’s a kingdom that seems very familiar, but also unique. Bethany is a character that I immediately fell in love with; she’s sweet and innocent, but never naive. Elissar, her eventual partner in crime, is also such a great character. She’s a bit of a rogue, a little rougher around the edges, but the two together make such a perfect team. The writing is one of the highlights of Songs for the Dead. The dialogue is serious when it needs to be, and often very funny. The artwork is bright and colorful, which is a bit odd considering it’s a story about a necromancer, but it works so well. It all blends to make an exciting story, and I can’t wait to see where it goes in future issues.